Are you a fan of Moose Drool? 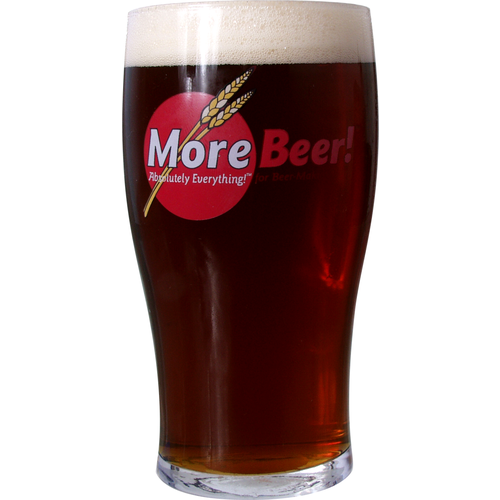 This is MoreBeer! 's take on the popular brown ale from Big Sky Brewing. 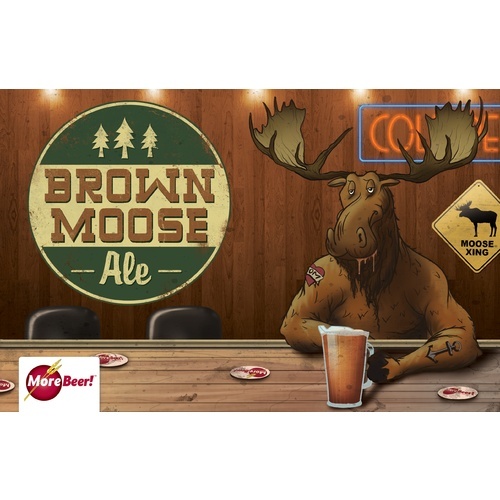 Combining 3 different steeping grains, our Brown Moose recipe is full of flavor! The chocolate malt, caramel 60L, and midnight wheat give this beer a nice light brown color and a taste that is light on the palate. Malt , caramel, chocolate, and coffee are just a few of the flavors you'll enjoy in this complex ale. If you like brown ales that leave you wanting more, but don't knock you off your feet, then this is the perfect recipe for you! Looks like a good spring beer. Just reading through the instructions, and in step 13 it says to use a solid stopper. Shouldn't I be using an airlock? BEST ANSWER: Yes, a blow off tube set up or an airlock filled with sanitizer is best practice. I only have a 1 gallon pot. Can I use that for the mash and boil then water it down to 5 gallons, at fermentation? This was my first attempt at homebrewing. I followed all instructions exactly as written. When I boiled this kit it made my whole house smell amazing! The fermentation took maybe 3 days to really start, I guess that's more a yeast issue than a kit issue? I tasted the sample I pulled for my hydrometer reading...pretty good. It got better after bottle conditioning. Smooth coffee and chocolate malt flavor, almost sweet. I was actually pleasantly surprised since this was my first batch. It ended up at 4.3% ABV. I was a little upset it wasn't higher but it fell within the range the kit specifies so that's cool. The only criticism I can really level against this kit (and THE reason I give it four stars) is the carbonation was pretty weak after three weeks of bottle conditioning. I would pour a glass and at most get a little fizz out of the beer. Don't get me wrong, I still drank it! But the lack of carbonation left me disappointed. Again, I followed all instructions to the letter! Since this was my first attempt at brewing I'm just glad I didn't have to dump the whole batch. Bottom line, if you like brown ales, can deal with the carbonation issue described (or better yet have a keg) and this is your first attempt I would say go for it. Thank you for your feedback. Please give us a call at 1-800-600-0033 or email us at info@moreflavor.com so that we can assist you. We are here to help. Cheers! I just tapped this beer and am very happy with the results. I got great compliments from family at a recent gathering. I don't think this keg will last very long. A great mixture of gains and hops makes a very interesting combination. I’ve had this in all grain and malt extract and both produce s great beer. Though not quite as chocolaty as the real thing, still an excellent brown ale. I enjoy the malty slightly chocolate taste of this brew. Turned out good for me. It tastes best slightly colder than room temperature. Refrigerate and pour and let sit for five or six minutes. I love the original of this, and the kit had just the right flavor to match. Really pleased. Good recipe. I like it and my friends like it. I label it with the name "Moose Juice". Full of flavor? You're dang right! I've enjoyed Big Sky Moose Drool, so I thought I would try this one. Although it's been a while, I think this is right on. It is superb. Just a nice, nice brew. You'll be popular amongst all your friends, for sure.